Powers/Abilities: Tithe can generate microwaves around her hands and unleash the energies as powerful blasts. Presumably she is also immune to microwaves, or else her own power would fry her. Despite her abilities, she has no real combat skills. History: (X-Men Legacy I#217 fb - BTS) - Tithe became a member of the Inner Circle of the Hellfire Club (see Comments). (X-Men Legacy I#217) - In the Hellfire Club's Manhattan mansion Tithe met with Castlemere and Leonine (in his human form) to discuss how their feud with fellow Inner Circle member Sebastian Shaw was going, unaware their discussion was being eavesdropped on by Wolverine, who had been tricked by Shaw into believing the Hellfire Club had kidnapped his son, Daken, and had snuck into the building looking for him. In the meeting room Leonine noted that they had accumulated enough weapons to conquer a small country, but Castlemere insisted this was not enough, as their task, outmaneuvering Shaw, was more difficult. Castlemere noted that Roberto Da Costa's recent resignation from the Club had thrown everything into question, and that Selene, who might have held the Circle together, was nowhere to be found; with no one to stop him, Shaw had already begun his bid for power, and had slain ten people loyal to Castlemere in the past three days. Unimpressed, Tithe countered that while Shaw previously led the Club effectively for many years, he was now a spent force, and Leonine agreed, stating that Shaw had no power base to build from, while the three of them held all the financial and logistic aces. Castlemere disagreed, noting that they only held all the aces they knew of, and that he wouldn't put it past Shaw to have entire decks up his sleeve. Castlemere insisted they should find Shaw and take the fight to him, but one of the others (unseen, so it is impossible to say which) countered that the mansion was impregnable, and it would be better to let Shaw come to them. Outside the room the eavesdropping Wolverine was spotted and loudly challenged by a guard; Wolverine quickly knocked him unconscious, but the noise had alerted the three Inner Circle members, who activated their powers and confronted him, believing him to be an assassin sent by Shaw. (Wolverine: Origins#29) - Tithe, Leonine and Castlemere battled Wolverine, but their fast-moving foe stunned all three with a succession of rapid blows, keeping them from co-ordinating their attacks long enough for a bomb he had rigged on the mansion's psi-field generators to blow. With the trio distracted and no longer shielded, from a safe spot outside the mansion, Wolverine's telepathic ally, Professor X, probed them and learned that they knew nothing about Daken's abduction. Realizing Shaw had tricked him, Wolverine announced that the interrogation had just become an execution and Tithe, who had only just recovered from his earlier attack, watched in horror as he slew Leonine. Castlemere blasted Wolverine in the back, but Wolverine shrugged it off and leapt at both Tithe and Castlemere. 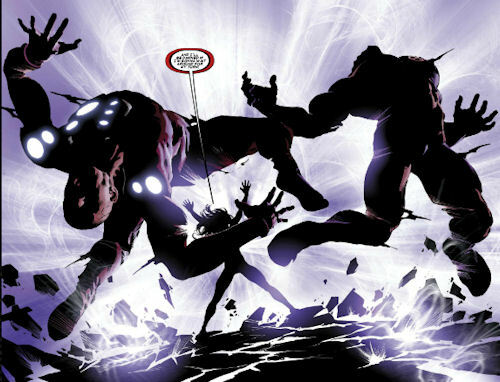 A terrified Tithe recoiled, yelling that Castlemere had made Wolverine angry, but Castlemere responded that he had made Wolverine foolish, and intercepted the lunge, electrocuting Wolverine in mid-air. Unfortunately for Castlemere, this didn't stop Wolverine, who grappled with the cyborg. Gathering her microwave energies, Tithe shouted to Castlemere that the two were too close together for her to attack, but then concluded that Castlemere was about to be killed anyway. Announcing that she wasn't going to wait around for her turn, she unleashed a massive wave of energy, engulfing the two men and destroying a large part of the mansion. Both men lay unmoving in the aftermath, but when Wolverine coughed, revealing himself to still be alive, Tithe elected to flee while he was still stunned, glancing back at the apparently dead Castlemere and pragmatically noting "Well, that's one way to get a promotion." Comments: Created by Mike Carey, Scott Eaton and Andrew Hennessey. We got to know very little about Tithe beyond her membership of the Inner Circle. Her rank within the Inner Circle is unrevealed, though she is presumably not high up, given her promotion comments; some sites online identify her as either a Black Queen or White Queen, but those are pure supposition based it seems purely on her being a woman, and hence leaping to the conclusion that she must be a Queen. Neither option is even suggested in the comic itself. Since most Inner Circle members are mutants and Tithe has superhuman powers, she is probably a mutant, but that's not a certainty; there were other exceptions to the mutant rule in the Inner Circle. She was probably an influential businesswoman of some type, since that seems to be one of the main requirements for being offered membership. It is unclear exactly when she joined the Inner Circle; she wasn't present at the group's meeting in X-Men Legacy I#215, so it is feasible that despite the small time frame between that issue and her debut that she was only just promoted to the group; however, it seems more likely however that she was simply absent from that earlier meeting. Assuming nothing happened to remove her from the club earlier, she was presumably ousted or killed prior to X-Men: Schism #2, when a group of elderly men where running the group and informed Kade Kilgore that they had purged the Inner Circle of mutants; even if Tithe wasn't a mutant, the new Inner Circle despised their predecessors, and so she would have been for the chop. Fittingly, the old men got purged that same issue, by Kade Kilgore and his new Inner Circle. 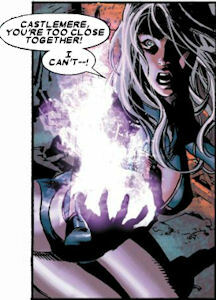 The energies Tithe generates are not specified in her comic appearances, but are confirmed as microwaves in the script for X-Men Legacy #217. 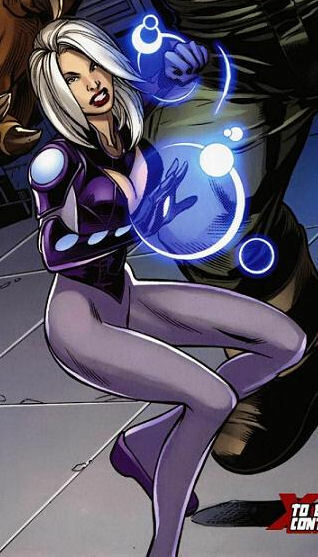 Mercedes is an apparent ally of Sebastian Shaw; Tithe was working with Castlemere to oust Shaw. It is certainly possible that Mercedes was being duplicitous when dealing with Shaw, but it is still evidence against them being the same person. 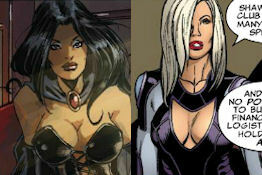 Much more tellingly, here's a picture of Mercedes (right, dark-haired) next to Tithe (left, white-haired). Again, it is feasible that between issues Mercedes decided to give herself a major makeover and bleached her hair, but it seems more likely they were intended to be different women. And the clincher: The script of X-Men Legacy I#217 identifies Castlemere's female ally as Sandra Morgan, a.k.a. Tithe, not Mercedes.